How Much is Enough? 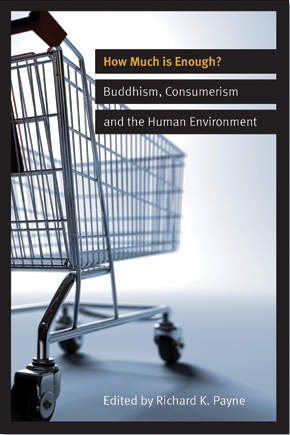 Buddhism, Consumerism, and the Human Environment, recently published by Wisdom Publications, Boston, is a compilation of papers presented at the international symposium on “Buddhism and the Environment,” held at the Alumni House, University of California, Berkeley, on September 14, 2003. The symposium was organized by Professor Mitsuya Dake and Professor David Matsumoto, members of the faculty of Ryukoku University, Kyoto, and the Institute of Buddhist Studies, Berkeley, respectively. Dr. Richard K. Payne, Dean and Yehan Numata Professor of Japanese Buddhist Studies at the Institute of Buddhist Studies in Berkeley, California and a member of the doctoral faculty of the Graduate Theological Union is the editor of the publication. â€œThe emphasis that the symposium placed on the human environment highlights the interdependence of our human social reality with the encompassing and supporting natural world. Seeing the interdependence of the social and natural, we can experience more directly the karmic relations between our actions and the human environment around us, both social and natural, said Payne. He also stated that the symposium brought to the forefront the concerns and efforts made by Buddhism and Shin Buddhism. â€œShin Buddhism has an important contribution to make to the environmental crisis, and to other pressing concerns of our times,â€œ he concluded. “The Early Buddhist Tradition and Ecological Ethics,” Lambert Schmithausen, Emeritus , University of Hamburg. The book is available at Wisdom Press or the BCA Buddhist Bookstore, Berkeley.